We know that car repairs can be expensive and crop up at the worst possible times. We also know that many of you smartly use credit cards to manage your cash. It is not unusual to experience an unexpected event, like a car repair, that can crimp your cash just before the holidays or a vacation. Our interest free financing program through Bosch can help get you past that cash flow crunch that all of us experience at one time or another. 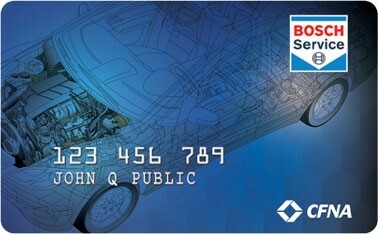 It is a great way to manage auto service expenses and is accepted at most other Bosch Car Service facilities throughout the country. For more details give Dave a call at 717-285-3738. *$299 Minimum purchase required. Interest will be charged to your account from the purchase date if the purchase balance is not paid in full within 6 months or if you make a late payment.